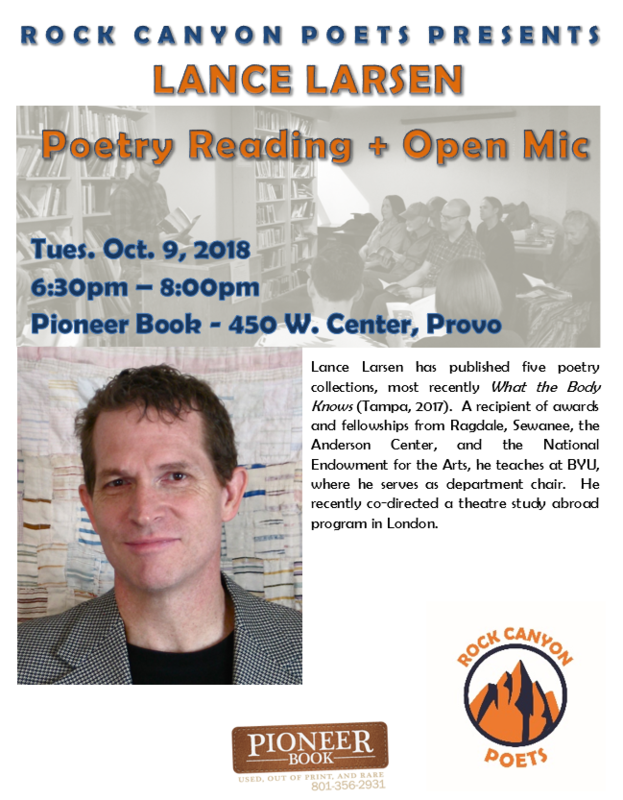 Rock Canyon Poets and Pioneer Book are please to present Utah poet Lance Larsen! The event begins with an open mic at 6:30pm and runs until 8:00pm. Lance Larsen has published five poetry collections, most recently What the Body Knows (Tampa, 2017). A recipient of awards and fellowships from Ragdale, Sewanee, the Anderson Center, and the National Endowment for the Arts, he teaches at BYU, where he serves as department chair. He recently co-directed a theatre study abroad program in London. You can read a sample from his book What the Body Knows here. Larsen visits Pioneer Book as a guest of the Rock Canyon Poets and Pioneer Book. The reading and open mic are open to the general public.